Chef-owner Mateo Granados, Mateo’s Cocina Latina, Healdsburg, CA: “When I make Thanksgiving dinner, I prepare traditional ingredients like turkey or squash with my own Yucatecan twist.” Squash and chiles are native to both the Western U.S. and Mexico; pepitas (pumpkin seeds) and pomegranate seeds are common in south of the border cooking. Preheat oven to 425°. Rub squash with 2 tsp. oil and set on a baking sheet. Roast squash, turning once, until tender when pierced with a fork, about 20 minutes. Meanwhile, spread pumpkin seeds on a rimmed baking sheet. Drizzle with remaining 1 tsp. oil and the table salt, stirring to coat. Bake until toasted, about 5 minutes. Put squash on a serving plate. 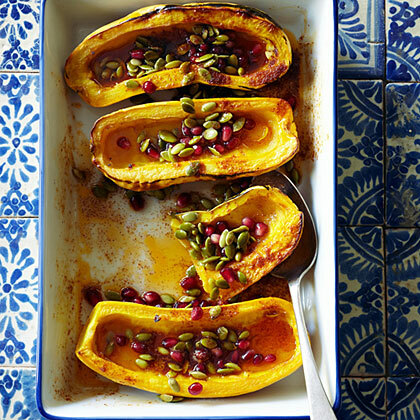 Drizzle with honey, then sprinkle with pomegranate seeds, toasted pumpkin seeds, and sea salt. Mix butter and cayenne and serve on the side for guests to drizzle over squash. Make ahead: Up to 2 days ahead through step Rewarm squash in oven 5 minutes, then continue with recipe.